MARKING a new distribution arrangement with diamond knife manufacturer Diatome, Agar Scientific is offering a range of deals on ultra-sharp diamond knives. As well as what it promises are attractive prices on new knives, Agar will take trade-in diamond knives from any manufacturer and offers a resharpening and reworking service. 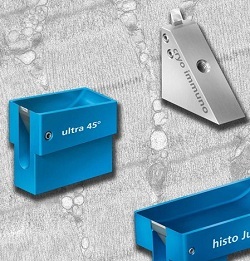 Diatome diamond knives are available for most laboratory applications, with the range including new versions of the popular trimming blades and cryo knives. Blade surfaces are hydrophilic for effective wetting at the cutting edge, even in situations where water levels are very low such as sectioning water-sensitive samples, Lowicryls, and other hydrophilic embedding resins. The shape of the boat gives good illumination of cut sections, and facilitates picking them up. Agar’s re-sharpening service puts these diamond knives through the same optical checking and sectioning tests as new knives. During resharpening, a knife may be reworked into another type, such as ultra to cryo or vice versa, or the cutting angle altered from 45deg to 35deg.